Welcome to the NetBeez blog. My name is Stefano Gridelli and I am a cofounder of NetBeez. In this opening blog post I would like to give you a little background on why Panickos, Panos, and I decided to build NetBeez. We worked many years as network engineers in large and complex network environments and realized the challenge of dealing with such systems that have dozen if not hundreds of locations. Answering simple questions like “Can users connect to this or that resource?” or “Is this a problem impacting one or many locations?” could take hours or days when working on network issues. Tools based on SNMP information, flow data, or packet capture are not enough as they only provide the up-down status of network devices, statistics about users traffic, or passively inspect existing communications to applications. We decided to build NetBeez and develop a distributed network monitoring solution that met these simple requirements: 1) It had to monitor via multiple agents installed at remote locations; 2) It had to be scalable because large enterprise networks have hundreds of locations; 3) It had to be easy to use and deploy, without requiring too much training, staff and expertise to install and use it. 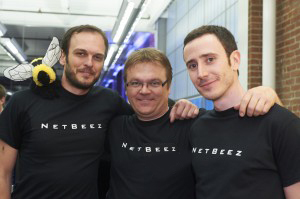 Many moons, coffee pots and lines of code later, we released NetBeez! Our hardware agents are plug-and-play and can be quickly deployed at remote offices or small WAN locations where there are no virtual environments or dedicated workstations. NetBeez agents send active traffic on the network and collect performance measurements continuously so they can be used to validate configuration changes applied off business hours when there are no users on the network. We know first hand how hard it is to remotely troubleshoot network problems without the proper tools, how important it is to have peace of mind when making configuration changes, and how negative is the impact of network downtime for today’s businesses. At NetBeez we feel like that we have accomplished the goal we initially set when we started development. We have a solution now available for enterprises that provides data on network availability and performance from the user perspective. The most rewarding thing is when we are told by our customers that NetBeez was able to decrease troubleshooting time, track rolls, and network downtime. That’s why we launched NetBeez: Simplify and improve the way enterprises run and support complex enterprise networks.